Welcome! Thank you for visiting our site! We welcome custom orders! 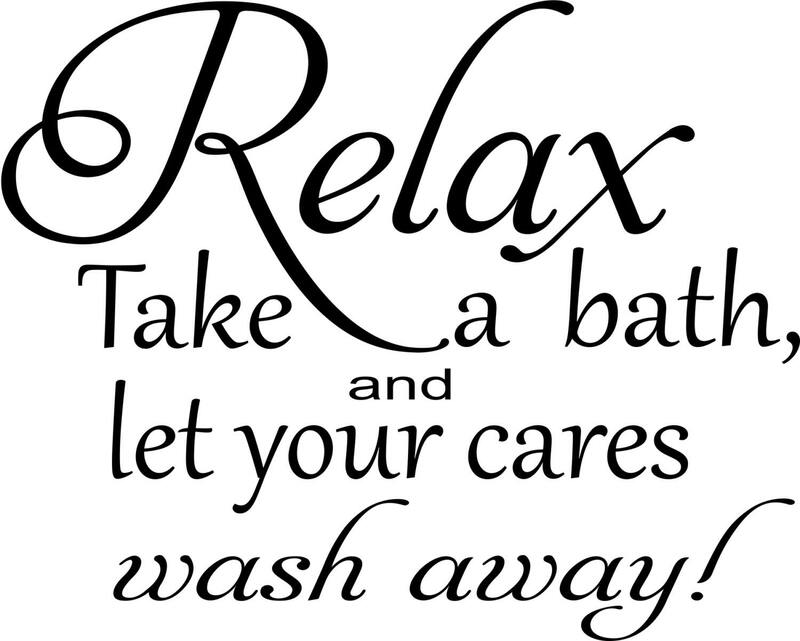 Relax Take a Bath, and Let Your Cares Wash Away! This decal is available in different sizes and colors. Please see our color chart in the 3rd photo. We offer many other decals for the bedroom and bathroom so be sure to look around the shop! • Need a different size? Contact us for pricing. • Washable and durable. Will not fade, crack or peel. • Our decals are removable, but not reusable, will not damage walls. 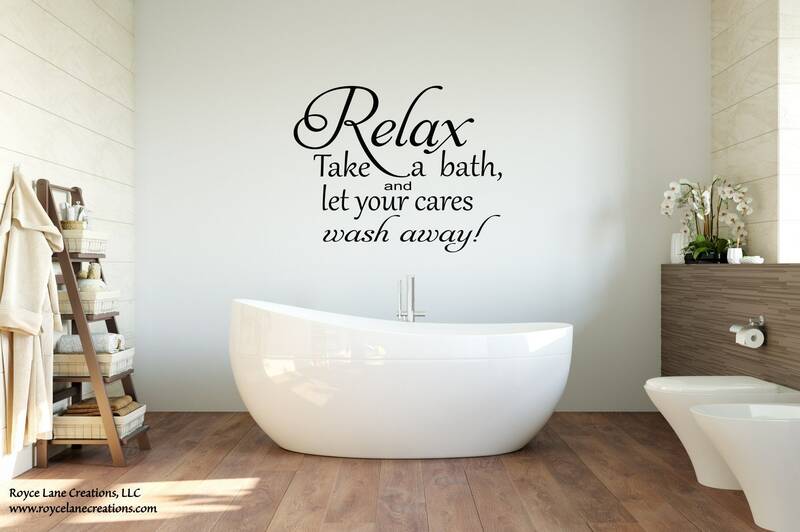 • Custom design your wall decals! Contact us for pricing. Vinyl and fabric decals may not adhere well to low voc or voc free paints or stain resistant paints. If you are not sure a decal will stick to your wall, purchase a test piece before placing an order. • Easy installation instructions will be included with your order. *Images and colors are for display purposes only and may not accurately reflect the actual size and/or color of the item. Please refer to the listing measurements for all sizes as photos may not accurately represent sizes with regard to other items in the photos (ie furniture). Measurements are all-inclusive for the entire width and height of decals. Sizes given are not for each letter. Our decals are cut vinyl-not printed. They do not have any background-neither clear nor colored. • We reserve the right to use/share/publish any photos shared with us on our websites or via electronic communications for advertising of our products unless expressly requested not to do so. •Change, restrict, delete. You may also have rights to change, restrict my use of, or delete your personal information. Absent exceptional circumstances (like where I am required to store data for legal reasons) I will generally delete your personal information upon request. For purposes of EU data protection law, I, Donna LaBarre, am the data controller of your personal information. If you have any questions or concerns, you may contact me at roycelanecreations@gmail.com. What shipping method is used? I ship via the United States Postal Service. Orders shipped outside the United States will ship via International First Class Mail. My standard shipping is First Class Mail or USPS Priority Mail shipping depending on the weight of the package. If you want your items faster, I offer Priority Mail and Express Mail as shipping upgrades. You can select either of these methods in the cart. Please make sure that your mailing address is deliverable by the United States Postal Service when placing an order. Orders are shipped to the address you select in Etsy during the checkout process. Please check all details before submitting an order. Packages that are returned and need to be re-shipped will incur additional postage costs. All delivery times are estimates. I am not responsible for items delayed during shipping for any reason. If your package is lost, a claim will be filed 30 days after the ship date. This is per USPS policy. Contact me immediately for decals damaged during shipping. I will need photos to submit a claim. Keep the box, contents, and packing materials until the claim has been settled. You may be asked to bring the box, contents and packing material to your local Post Office as part of the claim process. What surfaces will decals stick to? Our vinyl decals stick to most surfaces, however, I make no guarantee that decals will stick to all surfaces. If you are not certain a decal will stick to your wall or surface, order a test piece prior to placing an order. Vinyl or fabric wall decals are not recommended for use on gritty or sandy textured surfaces. Vinyl decals may not adhere well to surfaces painted with low voc, voc free paints, or stain resistant painted surfaces. All surfaces must be clean and dry before applying decals. I recommend washing surfaces with a solution of mild dish soap and water and allowing the surface to dry completely before applying decals. For window decals, wash and dry the surface and make sure that no dust or residue is left. How long are your processing times? Please check our shop announcement for current processing times. Generally processing times are 1-5 business days, however, during slower times we can ship faster. For personalized items that are sent a photo proof, the processing time begins once to photo proof is approved by the customer. Please check your email and reply promptly. If a photo proof is sent to the email address Etsy has on file for the customer and no response is received back, the order will be processed as is to meet the shipping deadline. 1 Business Day does not include weekends or U.S. Federal holidays. Where do I include personalization information? You will see a note box once you are in the checkout process. Please type all information in that box. Some personalized decals will include a proof. Emails will be sent to the email address on file with Etsy. PLEASE check the email address and shipping address for correctness. For orders that are sent a proof, if you do not respond to the email with the proof within 24 hours, the order will be processed as is to meet our shipping deadline. If no color preferences are given with an order, the decal will be made in the default colors as shown in the 1st listing photo. Our vinyl is a professional grade of removable matte vinyl. This 3-year film removes cleanly and easily for up to 2 years after application and has a matte surface that suppresses unwanted reflection. My removable decals leave no residue on walls, glass, windows etc. upon removal up to 3 years after application. Our vinyl can be used on many surfaces such as walls, glass, appliances etc. How do I remove a decal? To remove a decal, simply peel up a corner of the decal and peel away as if removing a piece of tape. No. Vinyl decals stretch out of shape when removed. They are intended as a 1 use item. How do I color match, and will you recommend a color? 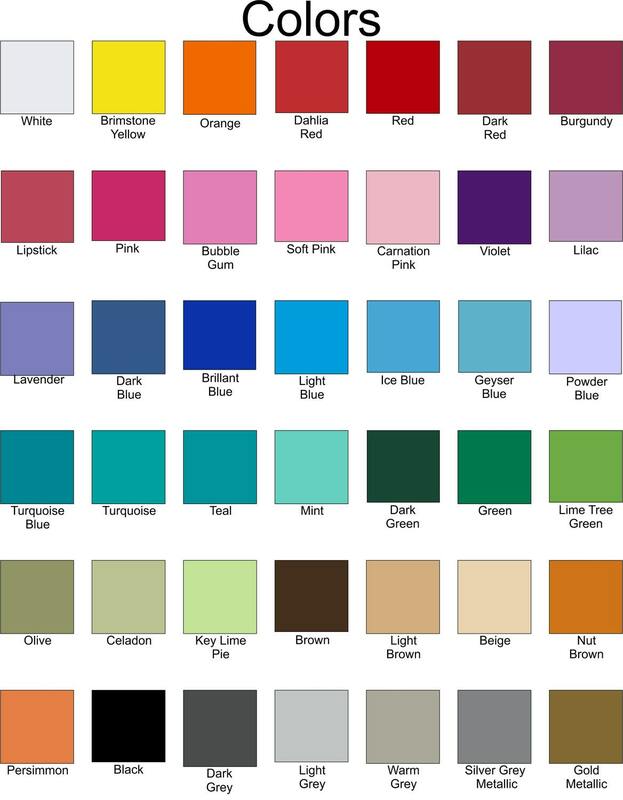 If you are trying to match colors, I highly recommend that you order color samples before placing an order. Some colors are very similar in appearance and can appear differently depending upon what other colors are in the room or even on the lighting in the room. Some custom and personalized items come with a photo proof. Others do not. If you want to see a photo proof before your decal is cut, type a note in the note box during check-out. If a photo proof is sent and no response is received after 24 hours the decal will be cut as was shown in the emailed photo proof. This is done to not hold up orders. Our turn around time is very fast, so please check your email! And please make sure the email address associated with your Etsy profile is correct.